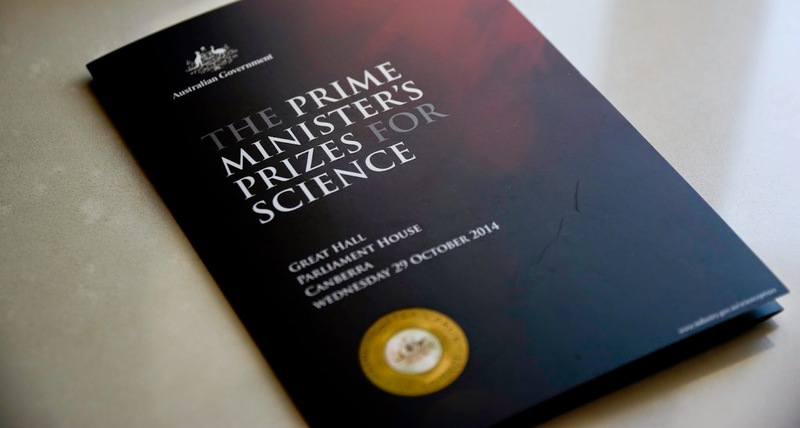 I was lucky enough to be invited to attend the Prime Minister's Awards for Science Dinner just yesterday. It was an absolutely wonderful experience and I'm still wrapping my head around the notion of even being /invited/ to this prestigious event. This was, actually, the first time they'd ever invited Science Olympiad participants to the event, so really, it was a matter of luck and coincidence that I was able to go. 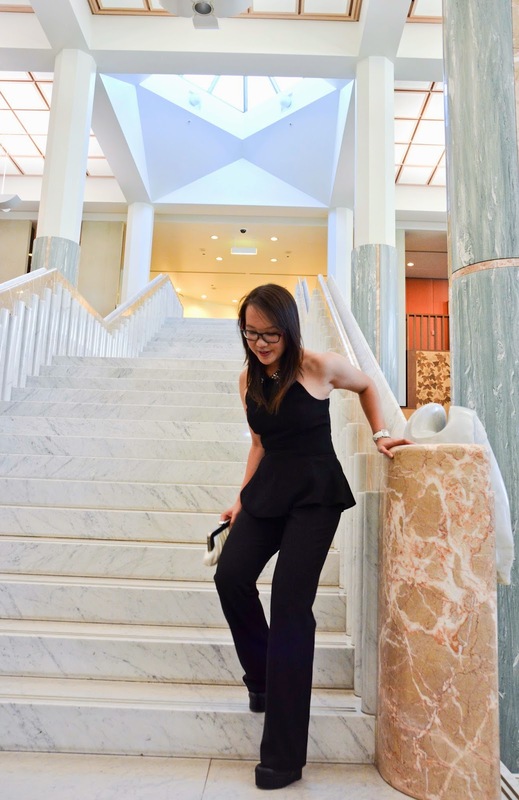 After a day at Questacon with my brother, I hurriedly chucked on my black-tie clothes and make-up in a public bathroom (none other than in the bathrooms of Questacon itself) and went to Parliament House. 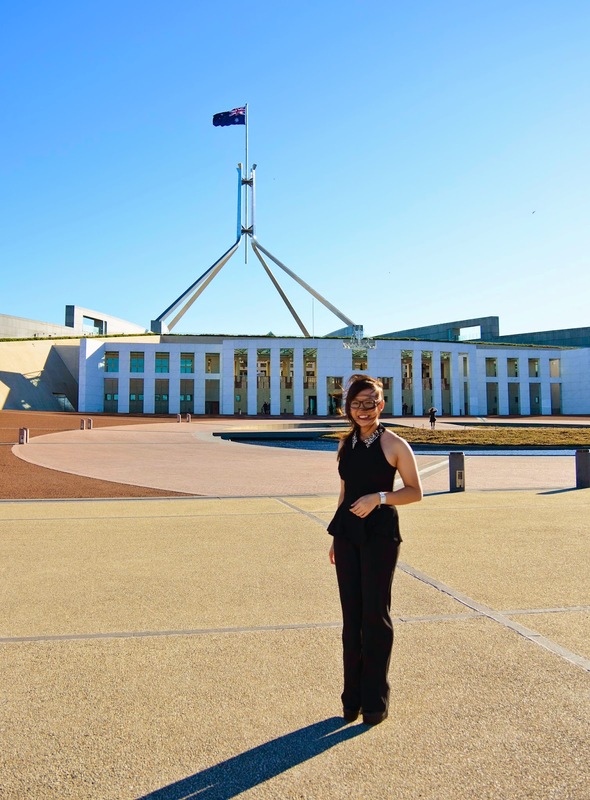 Took a few photos outside Parliament House (the wind was terrible) and then entered and got excited for the event that was about to take place! It was very windy. But the weather was nice. 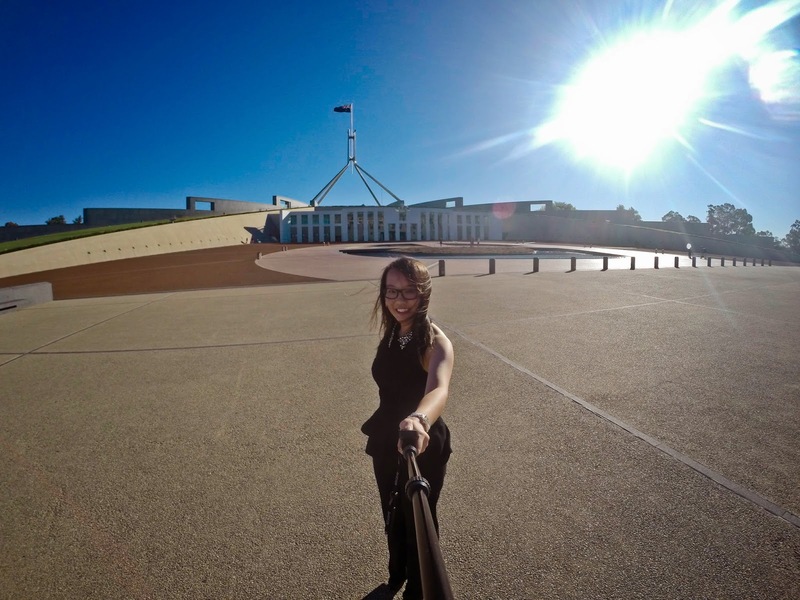 And, of course, a Go Pro selfie is in order. I think this is justified. AT, who was a participant from the IPhO, was another student who attended. So glad that we were seated at the same table and I had someone to talk to for the entire time. 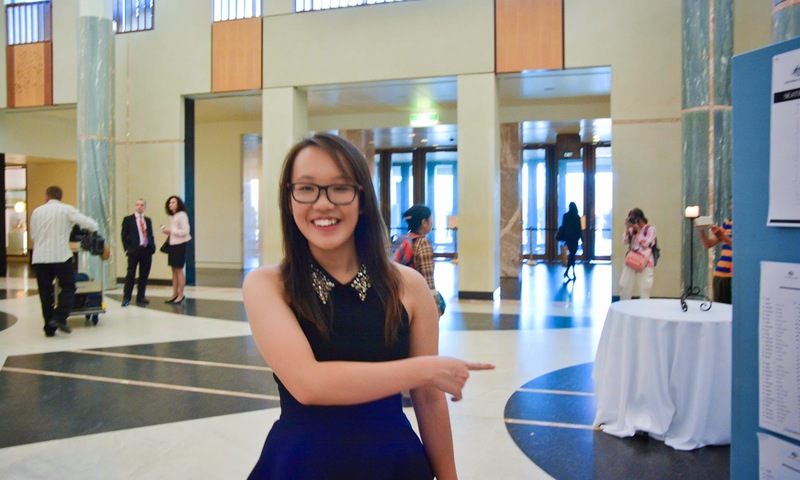 Also lucky that I finished my HSC just the day before, so I wasn't worrying about my exams during the night. However, initially, I didn't see him at the event. I spent an hour talking to a German Scientist from the University of Melbourne, who did work in cognitive neuroscience and behaviour, which was very interesting. His name is Stefan Bode, if anyone was wondering, and to be honest I hope that one day I'll be able to do something as incredible and game-changing as what he's doing. After talking for a solid hour and learning about a vast variety of things outside the hall (waiting for the official ceremony to begin), as well as turning down several offers for wine, it was time to enter the hall. If you look closely, you'll notice that they spell my name incorrectly. I was fortunate enough to be sitting at the front of the hall, right next to the stage (and on the middle-right table, as well!) so it made for a good opportunity for photos, and just generally getting a really great view of these incredible scientists. Anyway, I walked over to my table (Table number 23) and saw the familiar face of AT whom I had seen around at summer camp, and various other Olympiad team member meetings. Then, surprise surprise, the ceremony started, and guess who was hosting it! The one and only Adam Spencer. This was the third time I'd seen Adam, and he was still just as captivating and a wonderful host as ever. I'm not going to lie, the nerd jokes were incredibly funny. He's the one who taught me that even the most nerdiest things can be funny, as well. Even though I didn't understand half of the references, I learnt a tremendous amount about NOESY (Nuclear Overhauser Effect Spectroscopy) and laughed along about mathematics and it was incredible. To be in a room where this wonderful man makes a hilarious joke about physics, and have all the individuals in this room (I think around 200 people) laugh heartily and genuinely is an experience which was oddly refreshing. 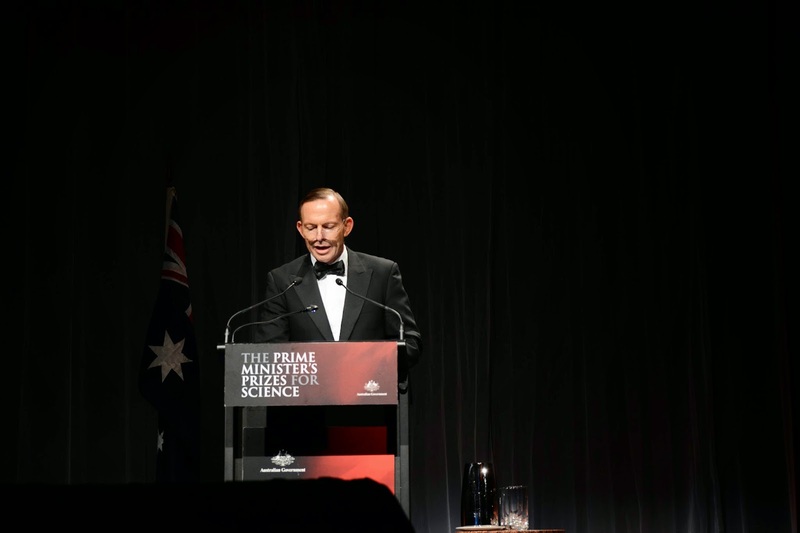 He then proceeded to invite the Prime Minister, Tony Abbott, to the stage for a speech. 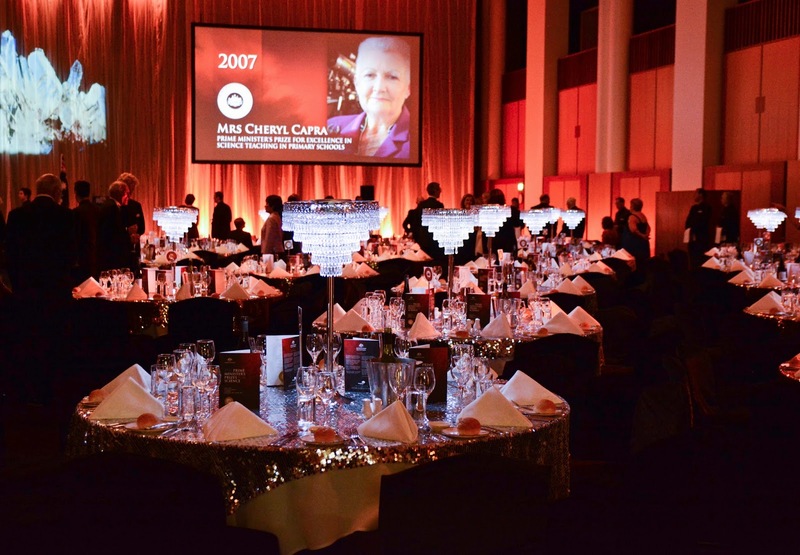 The awards were announced, and I can assure you, they were all well deserved. Much admiration for these people. 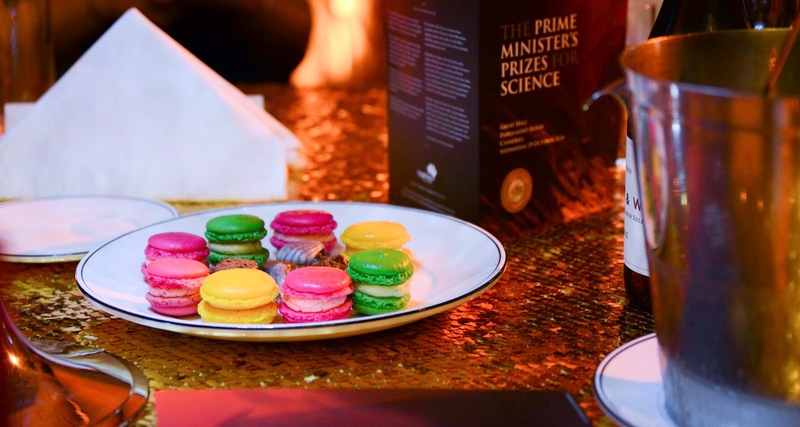 Geoff McNamara received the Prime Minister's Prize for Excellence in Science Teaching in Secondary Schools, and once again, it made me wish my high school was lucky enough to have such a dedicated teacher as himself. I feel that teachers are so underwhelmingly appreciated in society and it upsets me to no end. My teachers were the ones that truly nurtured my passion for science and encouraged me to pursue it, and I can never thank them enough. We often forget that children discover their passions at a young age, and without the correct care and encouragement, this curiosity and interest can be squashed. "It was Geoff's own uninspiring experience as a high school science student that compelled him to re-think how science would be explored in his classroom." and I completely understand where he's coming from. Too many times have I heard the phrase "I would have studied science, but (insert teacher name) ruined it for me." and every time I do hear those words uttered, I feel a little beacon of potential is extinguished. 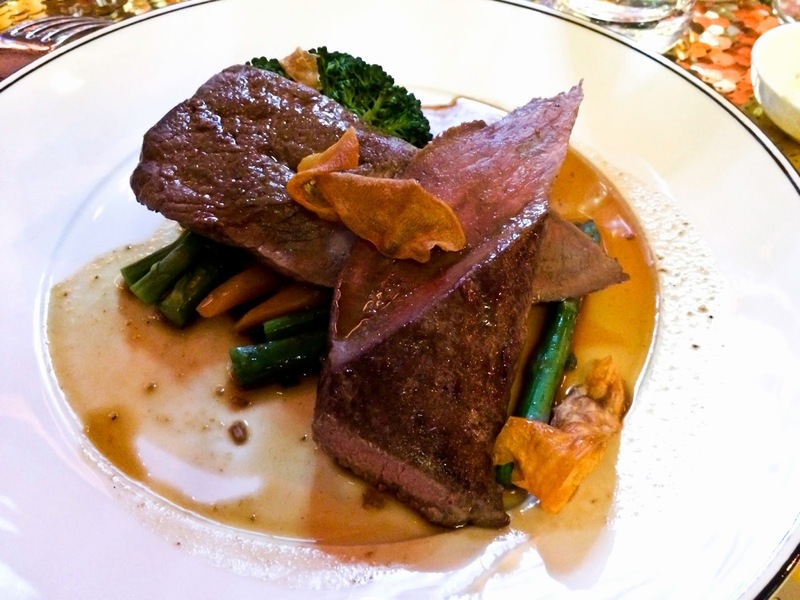 It was Roasted lamb loin with a white bean puree, braised brunoise vegetables, broccolini, sweet potato chips, and a Madeira jus. I don't even know what half of those words are, but I can assure you, it tasted delicious and I was very upset at the fact that I was too full to even finish my meal. 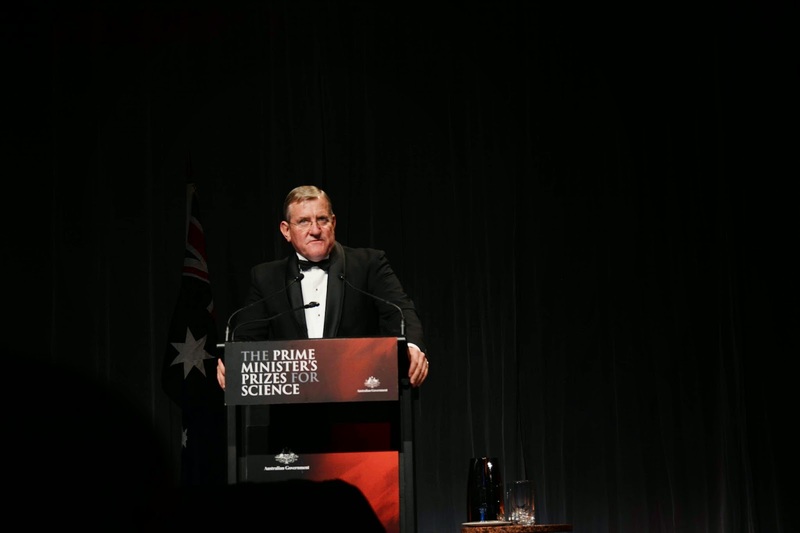 Two more awards were then announced, presented by the Minister for Industry, Ian Macfarlane. Matthew Hill received the Malcolm McIntosh Prize for Physical Scientist of the Year, and although I'm no specialist in crystals or physical science, I can assure you his work was wholesomely captivating and left me wondering at the marvels of nanotechnology (which, actually, I considered studying in University). His work with MOFs (metal-organic frameworks) not only made me laugh (because it sounded like moths. Yes, I am easily entertained) but the incredible nature of the substance itself. I don't know the nitty-gritty details of his work, but it has a huge variety of implications and I'm sure they will grow to have applications in various areas of society and industry in the next few years and decades. 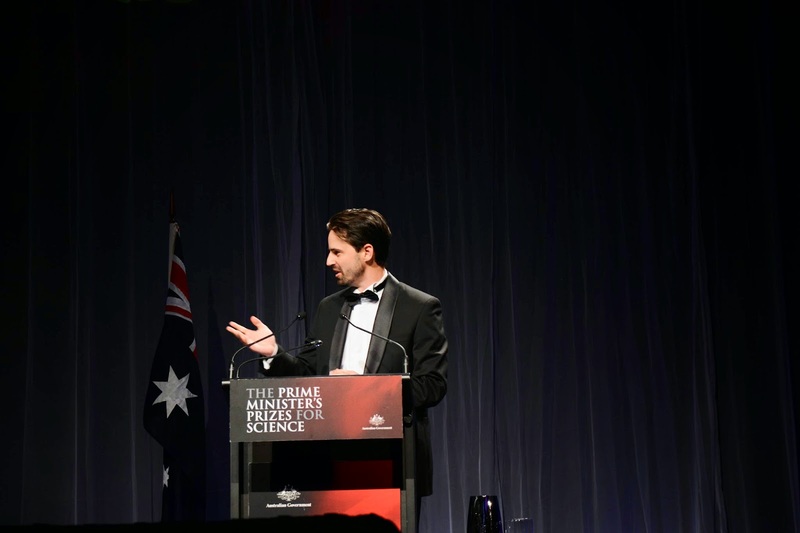 Ryan Lister received the Frank Fenner Prize for Life Scientist of the Year, and really explored genomics, which was absolutely fascinating for me because I really do love myself a little bit of genomics from time to time. (Side note, actually thinking of getting myself genomically sequenced). He explored stem cell medicine, which I think is a huge frontier, and gene regulation and the epigenome, which was actually something I wasn't quite familiar with before his talk, but now I think it's definitely going to be one of the leading frontiers in genomic science in the next few years. 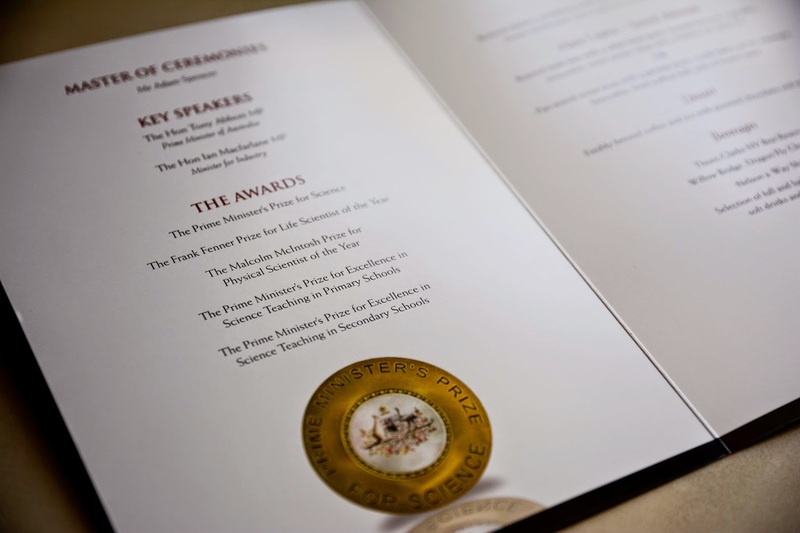 And lastly, Sam Berkovic and Ingrid Scheffer, both who did incredible work on epilepsy, were also inspiring; they received the Prime Minister's Award for Science. Sam Berkovic, was especially interesting, since he was also a neurologist and that really made my eyes light up like *~* and pay a lot of attention. Really hope that one day I'll be able to pioneer or do something even remotely as amazing and game-changing as them. I really loved the fact that they helped debunk a lot of the myths about vaccinations and the link of epilepsy to it. The anti-vaccination movement is something I definitely disagree with, and it's little things like misunderstandings that get blown up that lead to misleading conclusions like "vaccination = epilepsy", and they have such massive implications upon public health. Their work was truly admirable. Then, the ceremony began to close. Adam Spencer gets back up on stage and we all stand to toast the new found award recipients for their incredible contributions and work to Science, and it's all nice and well. 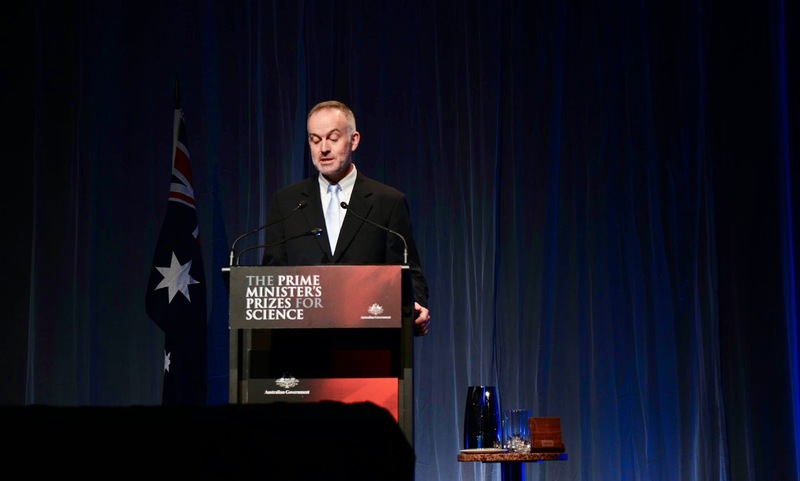 He concludes by saying that in this room are many, many people who have received PhDs, done incredible things, and have generally played such a huge and massive role in Science, but "now we must talk about the future scientists." He goes on to say that in this room there were two students who have yet to start their scientific journey; two students from the Science Olympiads. At this moment, I turn and look at AT with a massive face of shock plastered across my expression, and find that he returns the exact same feeling. We both were not expecting Adam to call us out for that at all, and it was an honour to even be mentioned or acknowledged at this prestigious event. Adam goes on to describe that one of us went to Bali, whilst the other went to Singapore to compete, and winning bronze medallions, and then continues on to announce our names. He calls the entire room to stand and give us an applause and I can assure you, in that moment, I could not believe this was happening. I'm not going to lie, being in this room with so many Doctors, Professors, and PhD receivers, as well as Noble Laureates and the like, was truly insane. 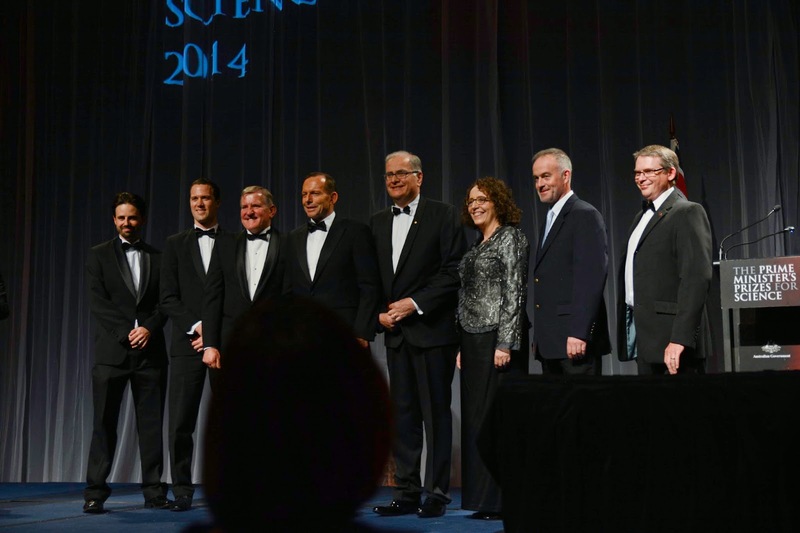 I felt like I was the little speck in the massive Universe of scientific achievements, surrounded by people who have led pioneering research and experiments for the greater good. 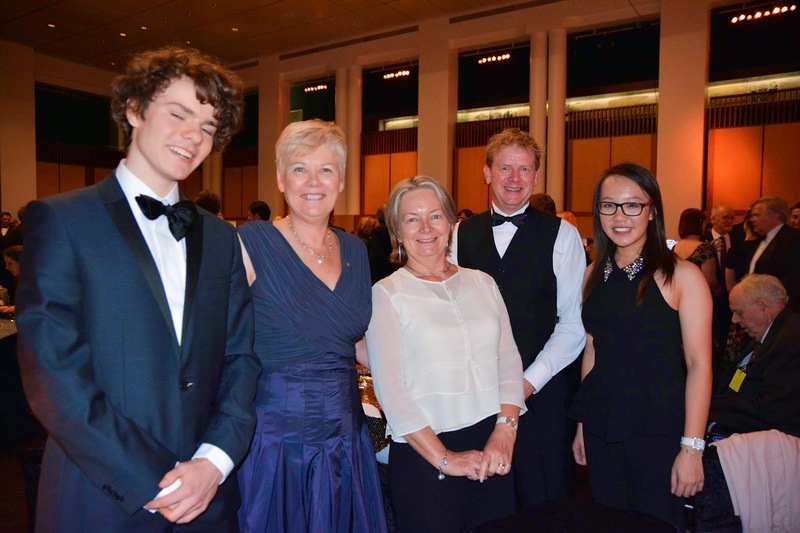 Meanwhile, AT and I sat there, just finishing off our HSC/high school, with hardly any claim to fame compared to these geniuses, and just sitting at our table being completely awe-struck and mind-blown by the sheer intelligence and dedication these Scientists have to the community. And Adam Spencer calls us out?? 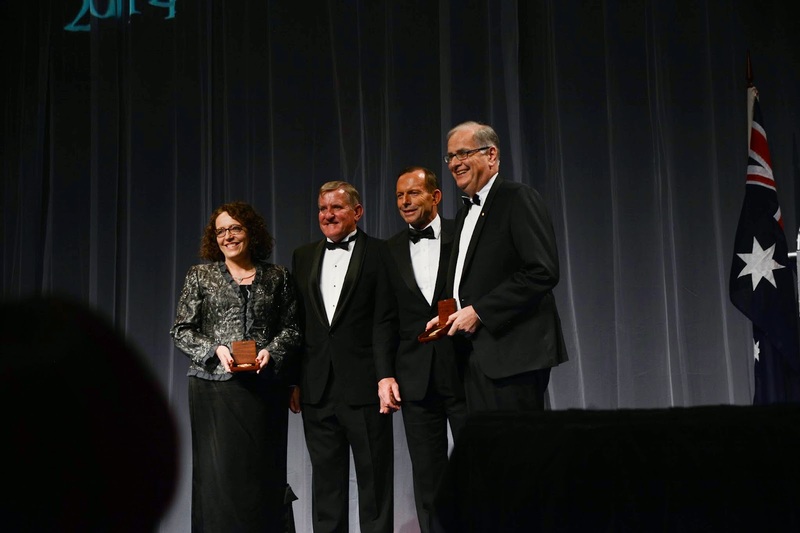 And the entire community of Australian Scientific big-wigs stand and applaud us? These two tiny seeds who have barely sprouted have our existence acknowledged by these people who have had so much more experience and achievements than us -- who have touched the lives of many and changed the world -- that was incredible and I still can't wrap my head around it. I still can't believe it happened and surely it wasn't deserved. Also, funny story, AT and I both misheard Adam (likely due to the shock of even being mentioned) and instead of sitting down whilst everyone else stood up and clapped, we both stood up as well (HAHAHAHHAA) and had the awkward, embarrassing and absolutely mortifying moment of realising halfway that 'oh, we're supposed to be sitting', and then immediately seat ourselves halfway. 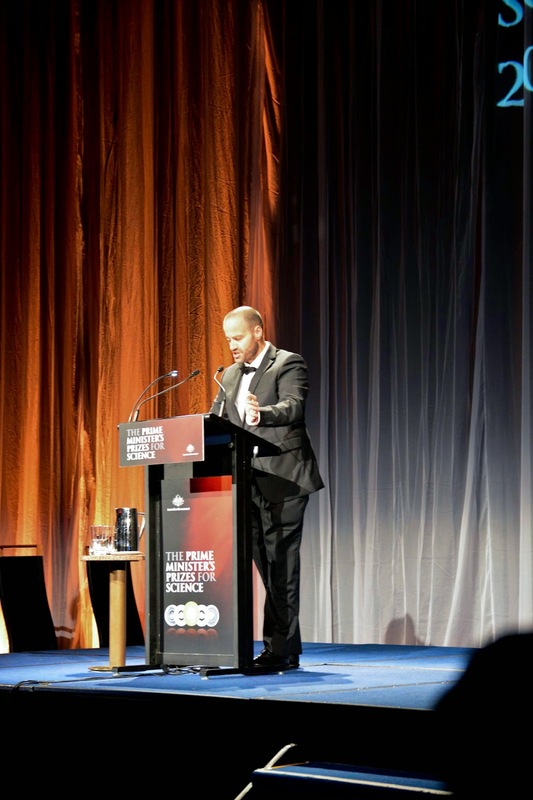 And then, to top it off, Adam Spencer makes a joke about us standing up, and then insists we stand up one more time whilst everyone looks at us and claps and laughs and we wave awkwardly to the crowd, shrouded in clouds of embarrassment. I can't tell if it was a pleasure to have made that mistake or whether it was completely mortifying. I think it was a little of both. This is only half the room. Imagine all of these seats filled with the most important Science-related people in the country, and all of them witnessing our embarrassing mistake. Hurrah for great first impressions. But that single moment made my entire day, and if not, is one of the most incredible moments of my life to date. 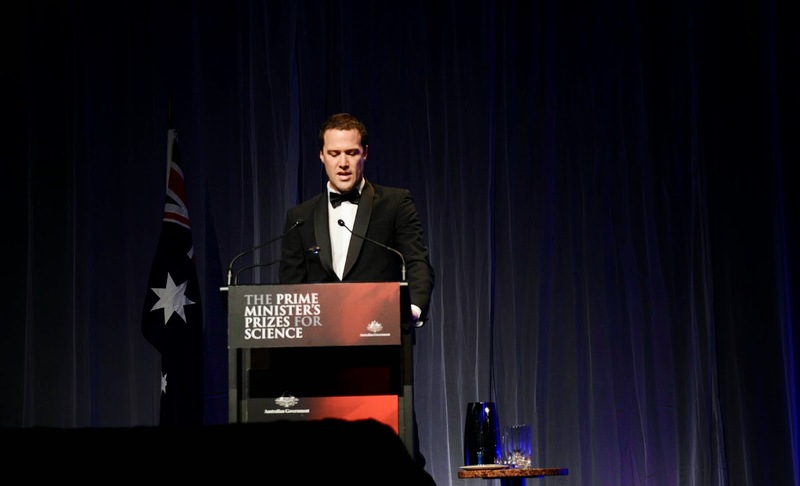 And it was great to represent young scientists, because I think far too often we forget to consider the future generations. 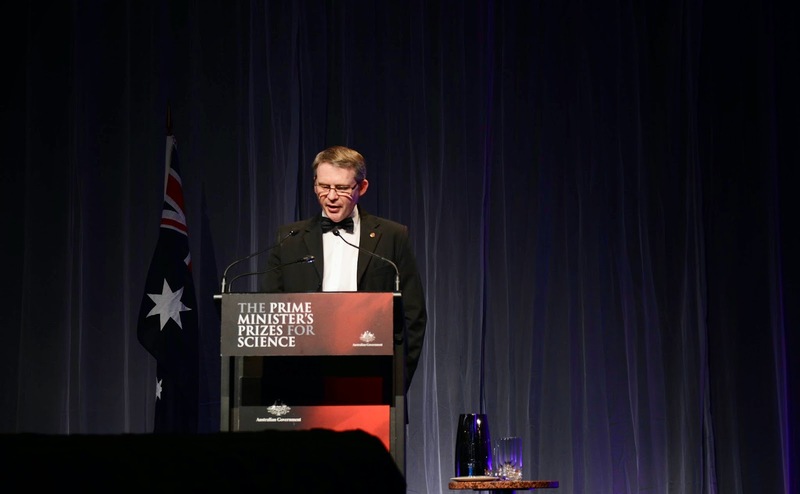 If there's one thing I can take away from that night, it's that the scientific community is wonderful, and I'm going to do my very best to try and encourage it. If not I, then who? If not now, then when? The experience of being in this entire community of people, all who work together to understand how the world works and cooperate to help solve the problems of the world -- that inspired me. That's what I want to be a part of. I've had glimpses of it at Summer camp and the IBO, as well, and each and every single time it's made me want to be a part of that world a little bit more. Call me the Little Mermaid of the Scientific world, if you want (how lame was that, I know), because it's something incredibly vast that I can't want to jump right into during University. Matthew Hill said something that was truly deserving of the round of applause that he received on the night. When posed the question "In 25 years time, what would you like to have seen achieved in the scientific community?" his answer was that (paraphrased; because my memory is not 100% accurate) he hopes in 25 years time, everyone will truly understand that we, as scientists, are working together and cooperating. No longer will it matter what discipline of science you're from, or the qualifications you have, or how long you've been working. He hopes that in 25 years time, when someone asks "What do you do? ", the answer will not be a science field or a job qualification, but rather, will be a description of the problem that they are trying to solve. Science isn't about a single journey. It's about working together to find out how things work, and to make sense of the world around us. Fields overlap -- there is no better discipline or better job. We're all just curious minds who want to know how things work and if we can't understand that fundamental concept, then it becomes almost impossible for us to truly advance scientific thinking to the highest potential that we can. Anyway, back to the story, after the formal conclusion of the ceremony, we were free to talk around to many people. AT and I spent a long time talking to many ASI board members, which was incredible. They didn't know we were here, and neither did we know they were there either, and it was wonderful talking to them for the first time, because we all had that similar link through ASI and I feel like I've grown a lot in the last few months, with the experience of the IBO and being exposed to so much ~science~. They also informed us that this was the first time participants had been invited, and as a result, I can assure you, I'm absolutely thrilled to have even been given this opportunity. If I had known it would have been this fantastic, I wouldn't have turned it down for the world. (hyperbole). The ASI crew! The ones behind everything, and who I am eternally thankful for. Several other people also approached us to talk to us throughout the night. 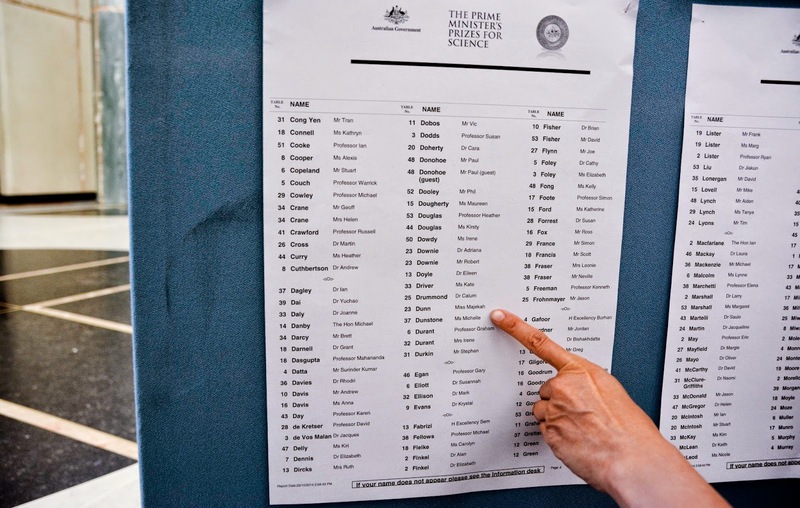 Some teachers from around Australia, and other scientists. We also got the opportunity to speak to Ingrid Scheffer's husband and son (who knew my IBO team mate, JH). 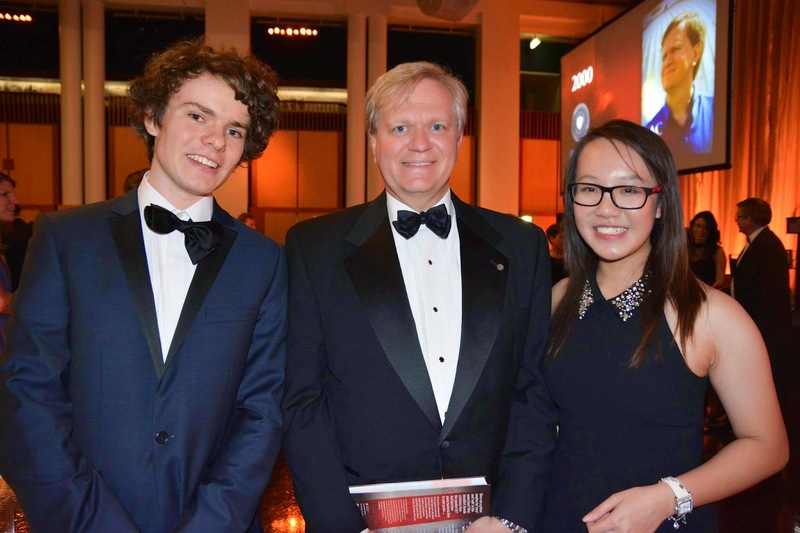 And then, would you have guessed, one of the ASI board members brings none-other than the Nobel Laureate Brian Schmidt to our table and we talk to him briefly. He was a shared receiver of the 2011 Nobel Prize in Physics for his work and findings in the theory of the accelerating expansion of the Universe. We met him at the Summer Camp as well, when he truly inspired the entire cohort to take on Science (he was a very good speaker and named us the "Guardians of knowledge" -- it made us laugh, because to us, we were none other than a few dozen kids who had gotten lucky in an exam), but I didn't get the opportunity to talk to him individually in January. And then well look, here we are meeting such an intelligent man and even getting a photograph with him! Truly beyond what I could have imagined. IT'S BRIAN SCHMIDT. LOOK. LOOOOK. We also were lucky enough to talk to Adam Spencer after the proceedings too, and he was just as incredibly welcoming as usual. Had a lovely, lovely talk with him, and he is a wonderful pioneer for Science and Mathematics at the University of Sydney, and really encourages and understands the passion for Science and Maths in the youth of Australia, which I think is very important. 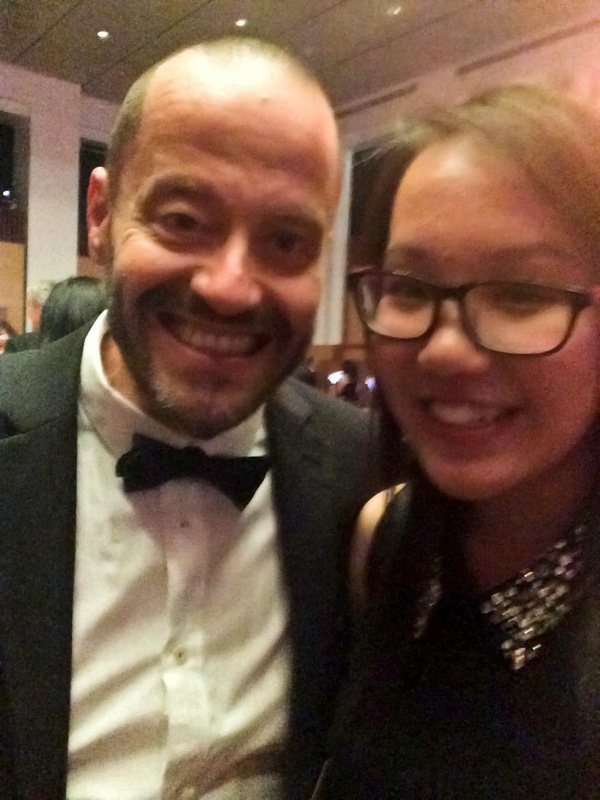 I also managed to get a selfie with him (finally!). He's an incredible man and I am sure this won't be the last time I hear of him. He's always up for a chat and genuinely is such a captivating man. I think I'm officially a fan. Sorry, just poor iPhone quality. The ISO is terrible, but oh well! It was an absolutely wonderful and incredible experience (I've used those words about a hundred times now in this blog post) and this was a very long-winded blog post, I know. I just had to get all of this down before I forgot it all because it was truly an experience to remember. I never would have known or even imagined that so much would have happened that night, and I can never truly understand why this all coincidentally happened to me. At the end of the day, I felt like I received much, much more than my deserved three seconds of fame. The IBO itself was enough for me, but to be interviewed so many times and have this wonderful experience last night -- these are things I could never have expected and they have taught me such an immense amount of knowledge about the scientific field and the future that I could never have comprehended before. With a twist in fate and the right coincidences, I was able to do so much and experience all of this and I really don't know how to express my thanks to the entire ASI team and even being invited to this event. At the end of day, I think I'm just a girl who had a passion for science, did an exam, and got very, very lucky. I'm not trying to brag or anything at all with this post. All in all, I think I received far more than I should have so far in life, and I'm eternally grateful for the experiences I've had. They have been life-changing and I hope that through this blog and my posts I can share that experience. All of this started with a single decision to participate in the Olympiads last year. That one decision changed my life completely, and it made me realise that you really must take every opportunity offered to you. You never, ever know what it may bring you until you try. I have said 'yes' to every single opportunity offered to me in regards to Olympiads and it has taken me so far within a time span of one year. I assure you that I do not intend on stopping this little habit of 'yes'; when an opportunity is there, don't get caught up asking 'why' or thinking about what you'll have to do. Ask 'why not?' and remember the potential that it could bring. For me, it was a single 'yes' that changed my life completely. That is something that I still find extremely extraordinary, and I still struggle to accept because under it all, I'm just a girl who loves biology. I'm not the best. And for this one success in life, I have failed so many times. I have tried so many times, only to find myself falling short. To find myself far from achievement. But that's life. I suppose something my parents pounded into my conscience as a young child was that failure is okay. But you must never give up. You must always want to do better. You must always want to succeed. You must always want and aim for the stars. But you must also accept yourself and understand that not everyone can be the best. Because if you get caught up in your failures, you start to lose confidence. You start to see others and think "there's no way I can do that". You start to think "if I tried, I would surely fail" and that is not a good mindset at all. We become individuals who carry out our own prophecies. What I'm trying to say is, it's okay to fail. Accept failure. We can fail, but we as humans are not failures ourselves. There is no one person who is a 'success' or a 'failure' -- we are dynamic balances of these concepts. We mustn't forget that. If there's one absolute thing I learned in the last year, it's that it made me realise that the world is out there for you to grab. Even if you're not the best, even if you don't achieve gold, and even if you fail a thousand times, there are things that are far more worth than that. There are things worth the effort, worth the hard work, worth the time and tears and stress you put into the things you do. There is the experience, and that's what I live for. That is what I live for. Anyway, I have a lot to do and I've pretty much exhausted out my fingers typing this entire post up. It's waffled on for a long time. To anyone who made it this far, congratulations, you may have one of the longest attention spans in the universe because I don't know if it's possible for anyone to even make it to the end of this post.